RBTH presents a selection of views from leading Russian media on international events, featuring reports and analysis of Russian President Vladimir Putin’s one-day visit to Ankara, alongside a preview of meetings between NATO foreign ministers in Brussels. The newspaper Moskovsky Komsomolets reports on the results of Russian President Vladimir Putin’s one-day visit to Ankara on Dec. 1. The Russian and Turkish heads of state signed eight documents outlining new opportunities for cooperation in finance, energy, trade, and law. Putin caused a sensation in the Turkish capital when he announced that Russia would be scrapping the South Stream gas pipeline, via which Europe was to receive 64 billion cubic meters of fuel a year. 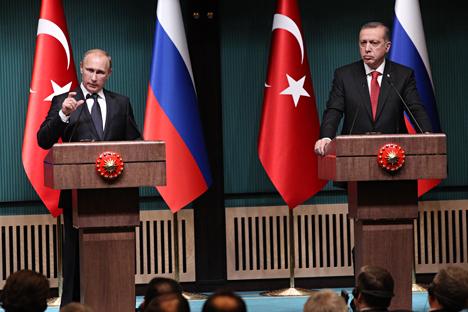 Putin made the announcement at a press conference following the bilateral talks, assuring that Turkey’s needs would be covered through the creation of an alternative supply system. The Russian president attributed Russia’s decision to the European Commission, which “rather than helping, created obstacles” to South Stream. He also pointed out Bulgaria’s moratorium on carrying out the necessary work within its borders. Putin stressed that the Turkish economy’s growing needs will be compensated for with the construction of an alternative gas system that will lead to the border with Greece. Moskovsky Komsomolets adds that a gas hub will be created for consumers from Southern Europe. Citing Gazprom chief Alexei Miller, the newspaper reports that Putin was essentially referring to the construction of a gas pipeline of the same capacity as South Stream, but heading towards Turkey. “Foreign Isolation Drives Moscow and Ankara Together,” reads a headline in a Nezavisimaya Gazeta article about Putin’s visit to Turkey. The newspaper notes that the Russian president’s visit should be regarded within the context of Russia’s so-called “pivot” to the east. “Despite Turkey’s membership in NATO and its continuing process of integration into the European Union, the country’s leadership is firmly committed to its course of maintaining and developing relations with Russia,” Senior Research Fellow at the Institute of World Economy and International Relations and the Institute of Oriental Studies at the Russian Academy of Sciences, Stanislav Ivanov, told the newspaper. According to Ivanov, Putin’s visit to Turkey has acquired special significance in the context of the sanctions imposed against Russia by the United States and EU. “Like Russia’s other strategic partners, Turkey could largely compensate for the expected loss from the sanctions,” Ivanov said. Particular attention was given to energy during the negotiations. “The high level of cooperation between the two countries is primarily connected with the energy shortage in the fast-growing Turkish economy and the search for new markets by Russian companies,” Danila Bochkarev, a senior research fellow at the EastWest Institute, told Nezavisimaya Gazeta. A key topic of conversation during the talks was the idea of lowering the prices Turkey pays for Russian gas in exchange for boosting gas imports via the Blue Stream pipeline (a trans-Black Sea pipeline between Russia and Turkey) by 3 billion cubic meters a year. As a series of meetings between NATO foreign ministers begins in Brussels, the Kommersant daily reports that the Ukrainian crisis and NATO’s plans regarding the conflict will be the key topic of discussion. All of the measures to be discussed will be connected with containing Russia in some way or another, the newspaper writes. “NATO is not Russia’s enemy,” NATO Secretary General Jens Stoltenberg said while meeting with a group of Russian journalists. According to Kommersant, Stoltenberg said NATO had never offered any other country such a privileged partnership. Stoltenberg named four conditions under which the NATO-Russia Council would resume its work: Moscow would have to stop offering support to the separatists, Russian troops would have to withdraw from Ukraine, all the points in the Minsk agreements would have to be fulfilled, and all international commitments would have to be abided by. In parallel, the NATO Secretary General announced that the NATO members would be stepping up their defense and offering support to Ukraine. Kommersant writes that the NATO foreign ministers will also discuss the implementation of three decisions reached on Ukraine at the summit in Wales in early September. Among the decisions are expanding NATO infrastructure in Eastern Europe and creating an elite unit on high alert based on the NATO Response Force. According to Kommersant, the majority of NATO members will contribute their own troops to the unit, although at this point only Germany, the Netherlands, and Norway have announced their willingness to participate in the project. Furthermore, four trust funds created to help Kiev implement defense reform will be officially launched within the framework of the NATO-Ukraine Commission. The cash will go towards financing projects in logistics, command and control, cyber defense, military medicine, and rehabilitation for injured solders.